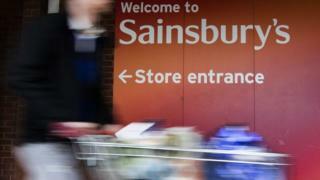 Half-year results at the supermarket chain Sainsbury’s have shown a 20% rise in underlying profits despite an “extremely competitive” market. Profits for the 28 weeks to 22 September were £302m, compared with £251m in the same period last year. The supermarket giant said it had benefited from the recent Argos takeover and the hot summer weather. These included restructuring store management teams and preparing for its merger with Asda, which is being examined by competition authorities. On the standard measure, pre-tax profit for the 28 weeks to 22 September was £132m, compared with £220m in the same period last year. Chief executive Mike Coupe said the grocery market was “extremely competitive”.